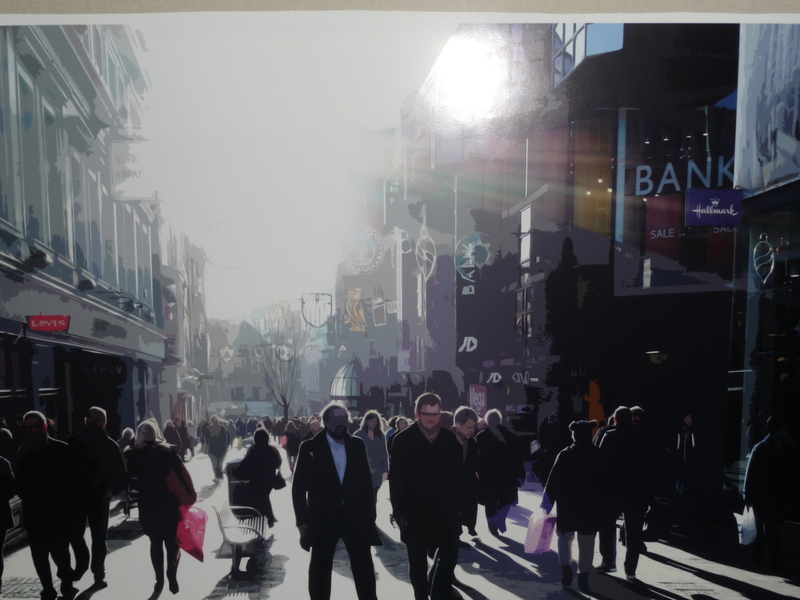 Poverty and Homelessness Action Week kicked off with the newly reformed Leeds Church Action on Poverty local group hosting a workshop on the attitudes across the generations towards wealth, those who enjoy it, and those who lack it. Our Action Week Coordinator Nick Franklin went along. The workshop was a fitting start to Action Week, because we need both to treat the symptoms of poverty and homelessness, and examine the assumptions and prejudices which cause such problems. This poster by a member of the Leeds Youth Cell Network was on display as part of an exhibition at the event. 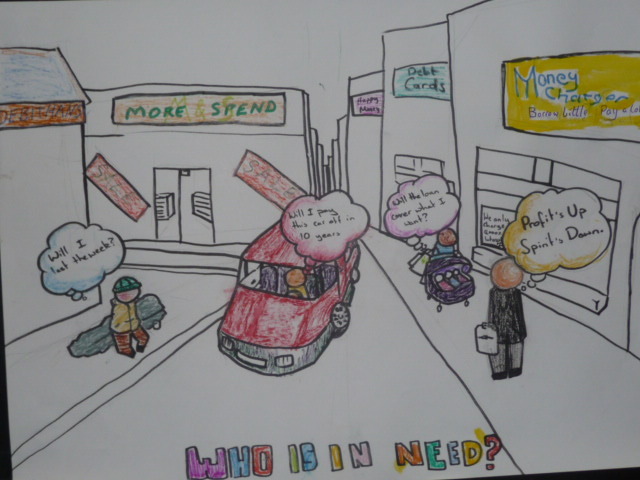 It’s a clever depiction of contemporary society and poses the key question of “Who is in need?” The brightly coloured signs create the illusion – certainly for most of us – of Real Need. Indeed, a trip to nextdoor Trinity Shopping Centre confirmed the enormous range and subtlety of marketing. Without our acquisitions, the world seems drab and colourless. Yet unbridled consumerism has consequences for us all – such as the financial debt and poverty of those who can’t afford to keep up, and the spiritual damage that Jesus warned attachment to money can bring. During Action Week we particularly focus on the poor person on the left who asks “Will I last the week?” – though equally we should not forget the businessman on the right’s sigh of “Profits up, spirits down…” The statue of the heavily-laden packhorse in the Trinity Shopping Centre is appropriate indeed! During Action Week, we call on people to ‘give, act, and pray for justice’ – activities which are in fact inseparable. The workshop closed with a reminder that unlike many people constrained by poverty and homelessness, whose freedom of choice is limited both from within (for instance by fragile mental health or addiction) and without (such as the high cost of basics like food, energy, and credit), we have the ability to make a difference – especially when organised into local groups like Leeds Church Action on Poverty, and national ones like Housing Justice, Church Action on Poverty, and Scottish Churches Housing Action. Perhaps Jesus will one day say to us what he did to Zacchaeus: “Today salvation has come to this house, because he too is a son of Abraham” (Luke 19:9). And not only to himself, but also to others through the justice Zacchaeus gave to those he cheated, and the generosity he showed to those in Real Need. Poverty & Homelessness Action Week is organised by Church Action on Poverty, Scottish Churches Housing Action and Housing Justice, and runs from 25 January to 2 February 2014. This entry was posted in Close the Gap, Fair Prices, Local groups, Poverty & Homelessness Action Week, Prayer and worship by Church Action on Poverty. Bookmark the permalink.